Product prices and availability are accurate as of 2019-02-24 18:59:19 EST and are subject to change. Any price and availability information displayed on http://www.amazon.com/ at the time of purchase will apply to the purchase of this product. This AMT self-priming centrifugal utility pump has 3/4" or 1" female NPT suction and discharge ports. The pump is self-priming (after initial fill), and the priming lift ranges from 6 to 15 feet, depending on the model. 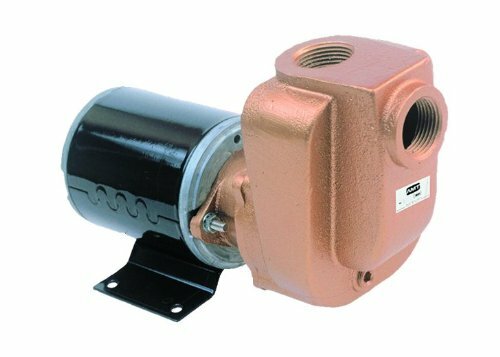 The pump housing is either aluminum with Viton (FKM, fluoroelastomer) seals or bronze with buna-n seals, depending on the model. The motor enclosure is either totally enclosed, not ventilated (TENV) for protection from dust or open, drip proof (ODP) for protection from dripping water, depending on the model. This portable pump is suitable for use in liquid transfer or recirculation applications. American Machine and Tool (AMT) manufactures centrifugal and diaphragm pumps. The company is headquartered in Royersford, PA.